MANIPAL– The Mityana Municipality Member of Parliament Francis Zaake who is currently in India for treatment is expected back home after gradually improving. According to Bridget Namirembe, Zaake’s wife, the legislator’s health condition is slowly returning to normal and he is expected back to the country on October 11 after being discharged by doctors at Manipal Hospital in India. “We are currently in a hospital hotel, praying and resting. I think he is now stabilizing. Doctors have kept moving him from ICU to normal wards because he has been on and off but we see changes now,” Ms Namirembe said on Monday. She said however, Zaake still has difficulty in walking and is currently undergoing physiotherapy. 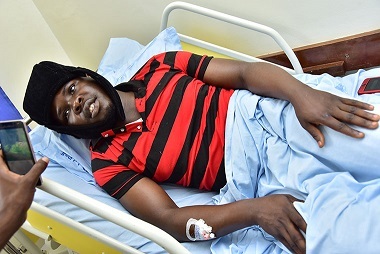 Mr Zaake has been at the specialist hospital for close to a month, seeking treatment following alleged torture he suffered at the hands of security operatives in Arua on August 13. Zaake is among 35 people, including MP Robert Kyagulanyi, alias Bobi Wine, who were charged with treason following the alleged stoning of the Presidential convoy in Arua during the chaos that marred the municipality by-election on August 13th. He was on September 3, 2018 released on bond, cleared to travel abroad (Indian) for special treatment. In India, team of psychiatrists, neurologists and physiotherapists have been working on his spine and neck injuries.